Hell’s Kitchen (walking distance from most hotels, the Convention Center, Target Center, the Theatre District, Twins ballpark and other hot spots) has an ADJACENT parking ramp that’s only $5 weekends and M-F after 4pm. We’re only a half-block from Nicollet Mall’s Metro Transit bus stops (routes 10, 11, 17, 18, 25, and 59) and four blocks from the Light Rail’s Government Plaza Station on 5th Street (Blue Line and Green Line). 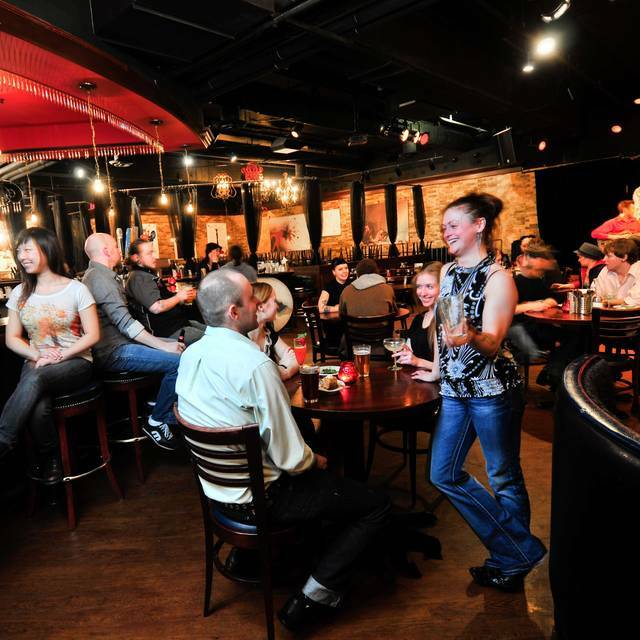 Live music in our Underround Lair Thursday through Saturday evenings from 6pm to 9pm and Saturday & Sunday brunch from 10am to 1pm. 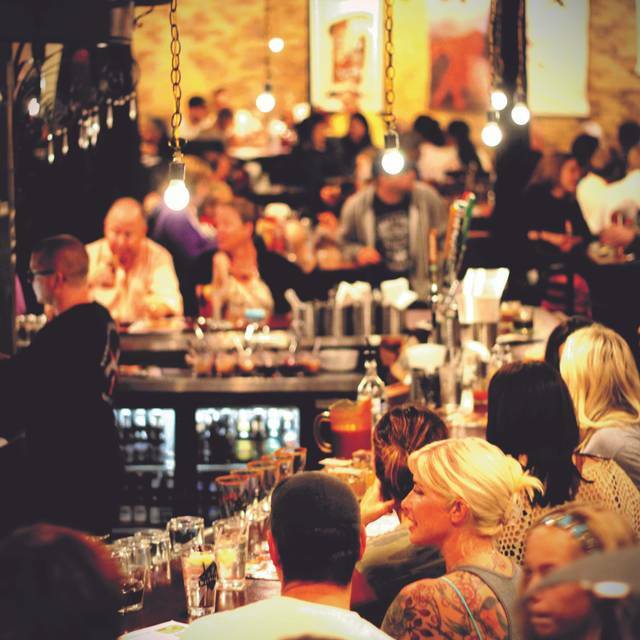 In the heart of downtown Minneapolis, appropriately located in a beautiful underground space, you"ll discover Hell's Kitchen, a chef-owned restaurant known for its damn good food. Join us for breakfast, lunch, dinner or drinks 7 days a week, and enjoy REAL food, not fancy contraptions...described by food writers as "unique but not fancy; interesting but not fussy". Almost everything is made from scratch, from our award-winning peanut butter to even housemade ketchup...winning us over 67 "best" awards as well as accolades in Gourmet Magazine, Conde Nast Traveler, Midwest Living and other national magazines. And bring the kids along...you should see the cheeky notes they write to us! Weekend Brunch is served every Saturday and Sunday from 7:30am–3pm with free live music in the Underground Room from 10am–1pm and our 35-ft Bloody Mary and Mimosa Bar available from 9am-2pm. PLEASE NOTE: All items marked "Gluten Free" should be considered Gluten-free-friendly (or can be prepared gluten-free-friendly with minor omissions). This is NOT a GF-certified facility. A warm, 1/2 pound, melt-in-your-mouth caramel cinnamon roll topped with roasted, salted pecans and a rich, house-made caramel sauce. Mitch's dad spent years developing this recipe; his mom spent years cleaning up the mess. So popular in Minnesota, these are practically a food group. Bite-size, salty, crispy, crunchy on the outside, soft on the inside. In addition to our classic tomato-basil soup, our chefs love to flex their creativity, so ask what they've got simmering on the stove for their "Soup of the Day." Here are the hotcakes that put us on the map (and won City Pages' "Best Pancakes" award for 2018). Three melt-in-your-mouth hotcakes made with freshly-grated lemon zest and whole milk ricotta cheese. 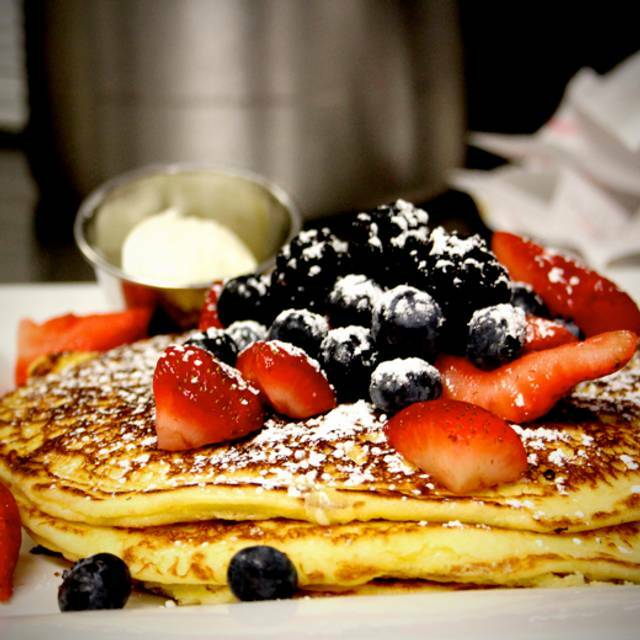 Served with fresh berries and pure maple syrup, but try your first bite without it! Native-harvested, hand-parched wild rice simmered with heavy cream, roasted hazelnuts, dried blueberries, sweetened cranberries and pure maple syrup. Adapted from 1800's trapper journals, Mahnomin (mah-NO-men) porridge is one of our top-selling, most talked-about menu items. But in our early days, nobody wanted to even try it, so we had to literally give it away in order to get folks to give it a go. Make it an Irish Porridge by pouring in a shot of Irish Creme Liqueur (bowl only)! Like it? Take home a Porridge Kit with everything you need to make 4 hearty bowls at home, just add cream. Minneapolis is known as the birthplace of melted cheese-in-the-middle burgers, ours has a big patty of Angus ground beef smothering a hot molten epicenter of cheese. Includes a side of sweet and spicy red pepper jelly. Warning: Hot molten cheese, watch your first bite! This hotter-than-hell­ burger is made of Angus beef mixed with jalapeños and other incendiary ingredients, then topped with melted pepperjack cheese. You'll notice a gradual buildup of heat to 3 or 3.5 on a Thai "1 to 5" scale. If this doesn't scare you, set your tastebuds on fire by adding habaneros, ghost pepper cheese, or more jalapeños from the add-on list below. Warning: no givebacks, whining or refunds! The Impossible Burger is a revolutionary all-natural burger that tastes, cooks, and smells like real meat, but is made entirely from plants. Reading about the Impossible Burgeris one thing, but biting into one is an experience even meat lovers won't forget. Served with chipotle-mayo sauce on a toasted bun. Vegan preparation upon request. Angus beef on a grilled bun served with a side of special sauce. If you're a "classic burger only" fan, fine. But for fun, many of our guests turn it into their dream burger with our wide variety of additions! Three tacos with fresh Cajun-seasoned walleye, housemade coleslaw, chipotle sour cream, housemade salsa, soft flour tortillas and a side of black beans. Warning: The Cajun seasoning really does have a kick, so if you're not the "spicy" type, just tell us and we'll leave the heat off. No givebacks! 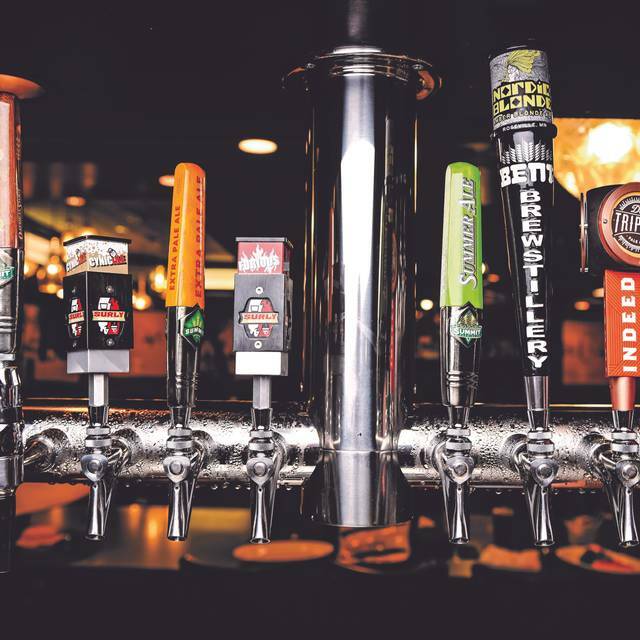 Good food - expensive beer - great music. We will go again. I read a lot of good reviews about this place so I thought I’d bring the family and give it a try. We tried the so called best Bloody Mary in all of Minneapolis, just to find a glass full of tomato juice and all I could taste was black pepper and vodka. The beer that came with it was room temperature. My kids had the pancakes and they seem to love them. My wife and I had the hells burger. Fries were really good some of the best fries I’ve tried along with the house made ketchup (tastes just like Heinz) but the burger.... it was a tasteless patty with ghost pepper cheese. If it wasn’t because I really enjoy hot food I would have provably not finished it. I will not be coming back and I really don’t know how they got 4 1/2 stars. I’ve been to many 3 star restaurant where the food is a lot more pleasant. We did not get to enjoy the live music and the food was good, not outstanding. Food was alright and the restaurant was really loud. It was hard to visit with my party. Mimosa was not very good for almost $10. We told them that it was a birthday but they don’t do anything except put a sign on the table. It wasn’t exactly what we expected for a special occasion. All the way around, Hot as At the Kitchen! Went with friends, had a blast! AWESOME bloody Mary bar!! The Bison Eggs Benedict is TO DIE FOR! Also the bloodys and the mimosas! Always such good service and the food never disappoints!!! Hells Kitchen is our go-to place for birthdays, as well as when we just want an awesome meal (can’t beat the Huevos). Our latest visit was for my wife and I celebrating our birthdays. Food was very good as always and we were fortunate to be able to be there when there was live music (the wonderful Cornbread Harris). Our family loves Hell’s Kitchen!! The ham and pear sandwich was excellent. Music was nice but service was a bit slow. 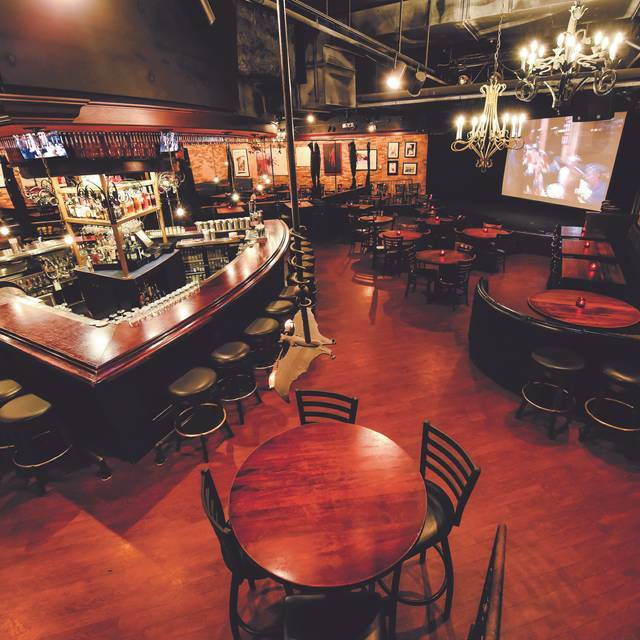 Fun place for music and bloody marys! Always a great meal and experience! Service was prompt, knowledgeable, patient, did not feel rushed. Food and drinks are always great! it was disappointing to be seated in the non-music room and VERY loud in that space. After a 15 min pre-brunch drink prep line we went back to our table. We ordered the Bison Benedict and the best part was the little mini salad. The meat was super tough like it wasn’t cut against the grain and it had no flavor at all...just your typical eggs Benedict. Nothing much to write about on that dish. However our friend had the Huevos Ranchero and said that was excellent as well as their ricotta lemon pancakes. The best part is that they were able to have a featured artist playing her folk music on stage. Loved it! Music was awesome. Overall, would I go again? Sure. But this time I’ll try their Mimosa Bar. Definitely recommend to anyone visiting Minneapolis. And, if you live here and have not been there, shame on you. Our server was fantastic - Very polite and personable. Yes, always would recommend this establishment to all my friends. 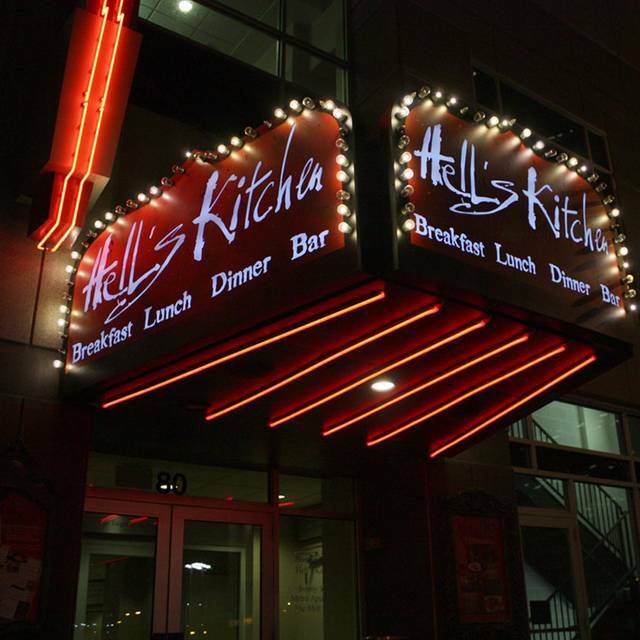 Loved our dining experience at Hell’s Kitchen while in Minneapolis for the Final Four. I enjoyed the delicious pan fried walleye while my friend enjoyed his stuffed au jus signature hamburger. Our waitress, Tommie was gracious, efficient, and pleasant. I will return on my next visit to Minneapolis. Thank you! It was Final Four weekend and we had 2 different reservations for 4 tops. There were very awesome about being able to have us all sit together at one table:) Go Hoos! Had the huevos rancheros and the bloody mary to start my day, it was awesome. We loved it. From the theme, to the food, and especially to the Bloody Mary bar. Incredible!! Would definitely go back if in Minneapolis. Not much of a variety for food. It was okay. I was hoping for a awesome brunch experience and this wasn’t it. So much fun! Great food and fun staff. Enjoyed the different flavors of the foods. It was very busy and noisy, but that is to be expected in a setting such as this. Can’t wait for my cookbook to arrive! (Brunch) food was pretty good, bloody mary bar was solid, and all served in a pretty unique environment. Loved our experience! Rarely does a “famous” restaurant exceed expectations, but Hell’s Kitchen certainly did. We had reservations and we were seated immediately during a busy Sunday brunch. Service and food were both excellent! Some of the best prime rib in the metro. Always good service. Never had a bad meal there. 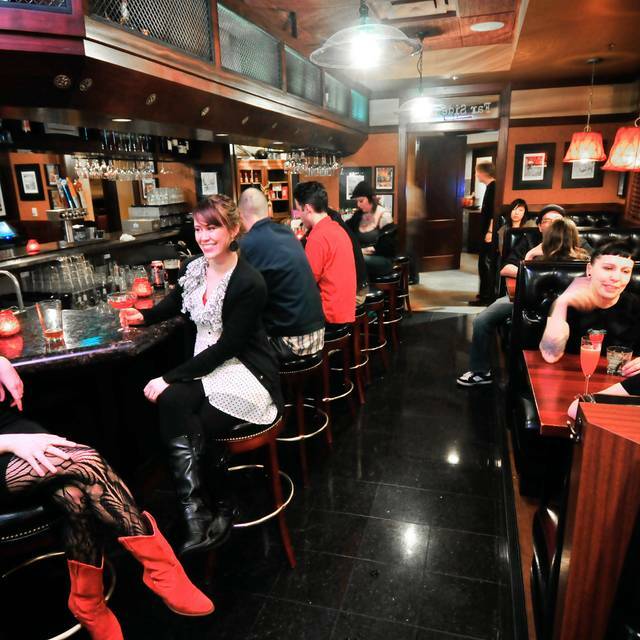 This place is a staple for my wife and I.
Hell’s Kitchen is one of our favorite downtown Minneapolis restaurants. Not only is the food amazing, it is as unique as the atmosphere. I have never had a bad meal nor experience here. We are celebrating our 34 year anniversary and hubby birthday!! Stoped in for a juicy Lucifer- vert delicious! Loved the atmosphere and evil pictures in the bathroom! The food was delicious but was lukewarm at best and my sister said her food was cold(no warmth at all). Service was pretty good but it was so busy that the service was slow and our food took around 40 minutes. Great time here, came while in town really just because of the iconic nature but loved the breakfast, the atmosphere, the live music, and the Bloody Mary Bar was awesome! Very relaxed atmosphere ands don’t miss when in Minneapolis. The staff is so friendly and helpful. The menu has a wonderful variety of foods so there is something for everyone. 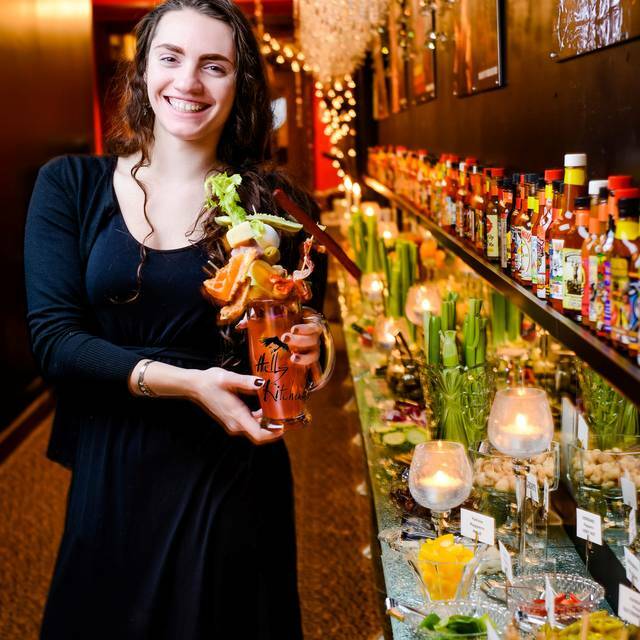 The must try is the Bloody Mary bar which is so unique and a favorite. They even have live music with great artists which adds to the already terrific atmosphere.